Asian Beef Carpaccio | Is Life a Recipe? A little home-grown recipe this. It’s a Carpaccio that I call Asian, because it was created here in Singapore and does have coriander in there. So there we go, Asian Beef Carpaccio it is, and shall remain. 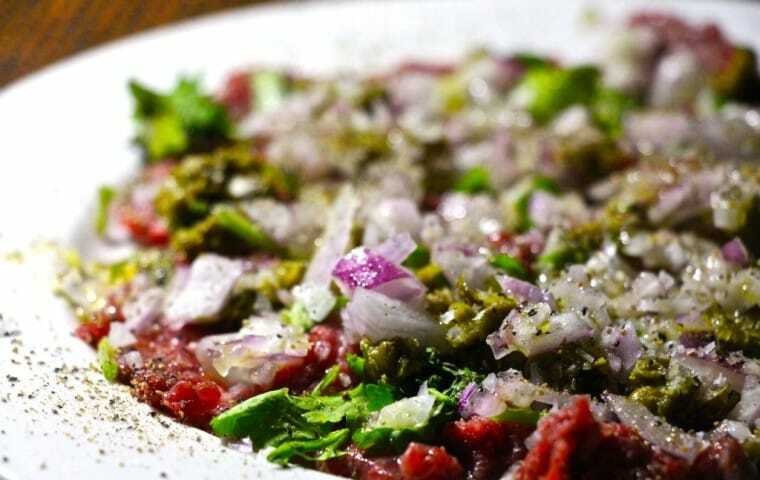 Carpaccio is basically a cold dish of raw beef – yep turn the eyes off and enjoy it, it is delicious. I mean just have a look at the photo – what do you think? Simple it is, and simply delicious it also is. It’s an absolute belter. Once you have had the steaks in the freezer for about an hour you are ready to go. But why steaks in the freezer? You are basically hardening the meat to make it easier to thinly slice. So when you have taken the meat from the freezer, and removed the cling film, take your sharpest knife to slice that meat as thin as you can. It will make a difference for your Asian Beef Carpaccio. You are done – now dig in and enjoy this puppy. It’s damn good. This is my Asian Beef Carpaccio. If you like fresh meat, not chewy, and Asian inspiration like the hards, and some sour from the capers, well you will love this one. Its simple, but looks all restaurant-like I think you’ll agree – ENJOY!!! No Replies to "Asian Beef Carpaccio"